Unification – the symbol of consolidation. You are trying to merge different principles in your life (similar to the union of black and white in the yin and yang symbol). The desire for harmony, balance and wholeness – you are willing to bring the opposite parts into a fruitful unit. What seems to be the “water and oil” at the beginning can be perceived as the “plant and fertile soil” at the end. The first can never be mixed together, the second leads to growth and fulfilment. Are you actually married? The dream naturally reflects your present situation. It makes a big difference whether you are single, married or divorced. 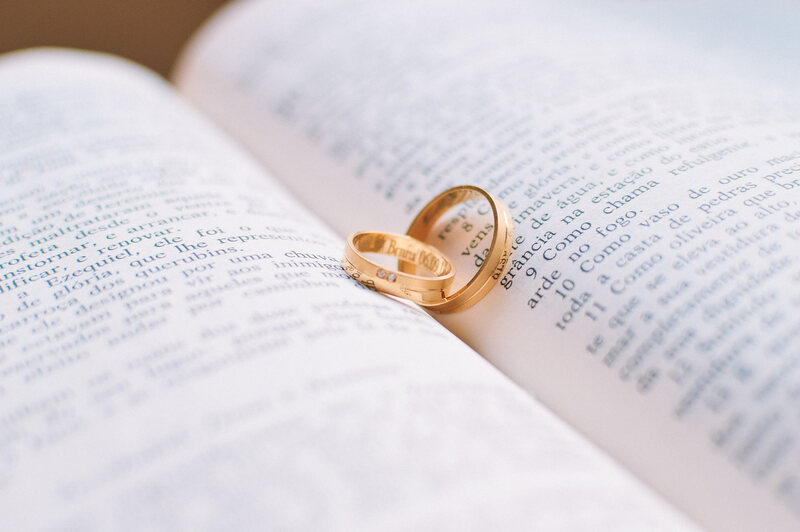 Single people are often looking forward to the wedding, married people are usually dealing with problems of the actual bond and divorced people are seeking new fulfilment or recalling old memories. Who is getting married? You or someone else? Even the wedding of other couples can be significant for your own wishes, intentions or solutions. If you feel that the married people are only substitutional for other aspects of your activity, try to think about different powers you would like to unify and harmonize. For instance: the man can be the “rationality” and the woman the “emotion” or the man can represent “pride” and the woman “modesty” etc. How is the wedding going on? Is everything fine or problems are emerging (dirty clothes, rude people, forgotten ring etc.)? If things do not go smoothly, it is a sign that harmony is far away. The dream indicates problems in relationships – it can be a disagreement with a soul mate, a cancelled appointment, an unsuccessful business negotiation. Our clothes are very important when we meet others. Maybe you know the old proverb: “the tailor makes the man”. The dress tells others a lot, about our style, wealth and overall position. When you dream of a wedding dress, it is one from the most visible symbols of this event. Everybody knows at the first sight who is the bride. The wedding itself can be interpreted as the determination to balance and harmony. You are willing to unify the opposite principles, the male and female one. You, as the woman, are the one who agrees and says the deciding and very important “Yes”. To wear a dirty or torn wedding dress in your dream indicates that you see problems and difficulties in this process. Conversely, the nice and clean wedding dress is a sign (or a wishful thinking) of peaceful coexistence of people, ideas, tasks etc. The ring is the symbol of eternity and infinity (see Ouroboros – a serpent or dragon eating its own tail). But unlike other symbols, which are drawn or written, this one is solid and tangible. The ring is usually made from gold or other precious metal. It gives you also the power (remember the One Ring from the Lord of the Rings; the circular shape of a ring is the same as the king's crown). As an engagement or wedding ring it should represent the devotion, fidelity and the eternal future that lies ahead. When you dream of a wedding ring it means that you seek a strong bond (between people, ideas or tasks) and the power to control it. If the ring is cracked or damaged it means that you sense essential problems in such effort. The wedding reception is a very special social gathering. Many people who often had never seen each other before are meeting in one place. It is a metaphor for our close neighbourhood or even the whole society (How they will accept our new effort? Will they be supportive?). There is also a lot of food, drink and fun on the wedding reception – the people are “absorbing” and “welcoming” the new married couple. You can see the “swarming” or the “hustle and bustle” which can herald the future “wind of the events”. The atmosphere of the wedding reception in your dream is a presage of how will your endeavour of the integration of something new be welcomed by others. Aside from that someone is actually asking for your hand – the wedding proposal is the first step on a long journey towards the marriage. In your dreams it can remind the intention to obtain or refuse something new. Who is proposing the woman is crucially important (A familiar and pleasant man or some stranger? Are you willing to accept the proposal? Are you forced to it?) The wedding proposal reflects your actual mind-set. Are you able to accept and integrate new ideas, offers or experiences into your daily life? Would you like to settle new things down, to combine and unite them or rather to reject them? To take a look on various famous art pieces can be very helpful when looking for the meaning of your dreams. Hogarth challenges the ideal view that the rich live virtuous lives with a heavy satire on the notion of arranged marriages. 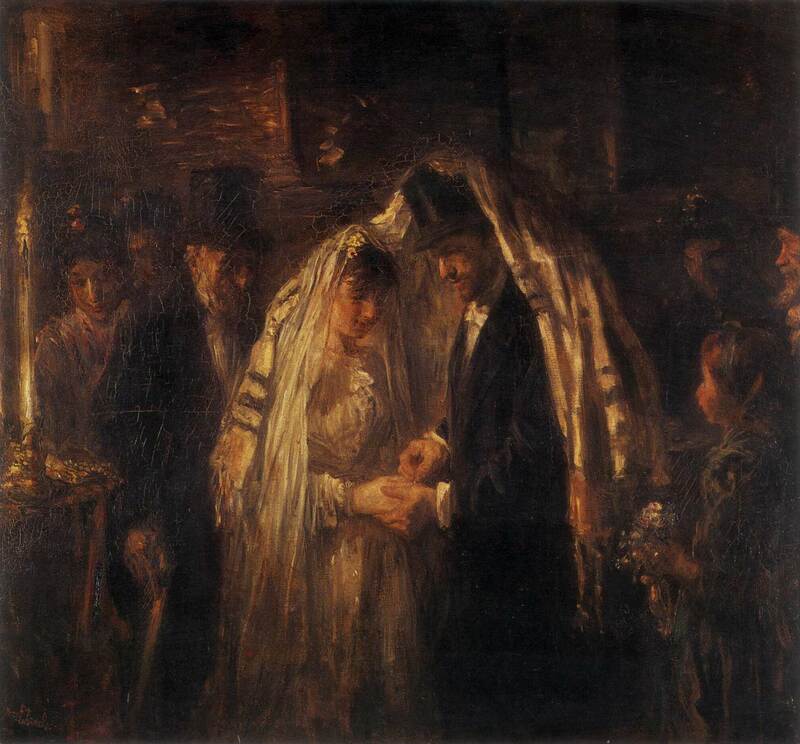 The Spanish Wedding is a painting of the signing of the wedding license or registry after the marriage ceremony. The bride looks sad and reluctant, while the elderly attendant standing behind her encourages the bride to kiss the groom. 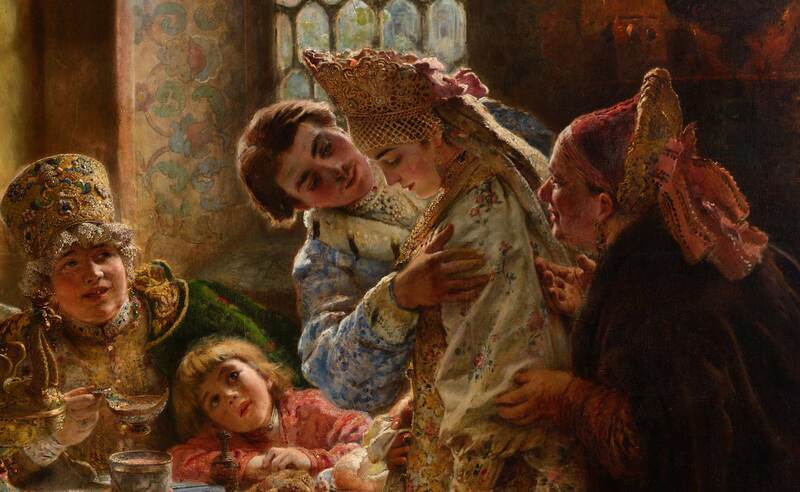 This large painting depicts one of the most important social and political events of old Russia, a wedding uniting two families of the powerful boyar class. In the middle there is the bride dancing with an older man, her father. The bride is in front of the green textile wall-hanging, with a paper-crown hung above her head.